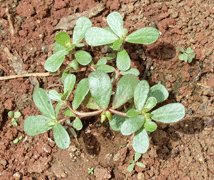 Purslane, a low-lying succulent plant with a lemony flavor, grows as a weed in the fields and in the culinary herb garden. Pull it up and try it! Low in calories and fat, purslane is rich in dietary fiber, vitamins, anti-oxidants and minerals. Fresh leaves contain more omega-3 fatty acids (alpha-linolenic acid) than any other leafy vegetable plant: 100 grams of fresh purslane leaves provide about 350 mg of alpha-linolenic acid. Purslane also has one best sources of Vitamin A among all green leafy vegetables. It’s rich in Vitamin C, carotenoids, and some B-complex vitamins, including riboflavin, niacin and pyridoxine. It also has many dietary minerals, such as iron, magnesium, calcium, potassium, and manganese. (Note that purslane also contains oxaclic acid, in case that is a concern). Use fresh, raw leaves as vegetable juice. Include fresh, tender leaves in salads. Sauté and gently stew the stems and leaves to serve as a side dish with fish and poultry. Add to soup and curry preparations and eat with rice, as in South Indian regional cooking. Stir-fry and mix with vegetables and other leafy greens such as spinach.